Nourish Bakery, the first of its kind bakery produces grain-free foods for people with special dietary requirements, or those who just want to live a healthier lifestyle. Based in Madison, Alabama in an antique, refurbished church, the bakery is now selling their food nationwide. Founder Stacey Schlaman says she was inspired to start the business through her own trial and error experiences in trying to provide grain-free meals to her daughter, who had symptoms of auto-immune diseases. Ms. Schlaman was an advocate of healthy eating and exercise as a personal trainer and yoga instructor. She saw that her clients following lower carbohydrate diets seemed to have the most improvement in strength, endurance, weight loss, and general health. Her company, Nourish Bakery, is committed to the production of sweet and savory foods that go “Beyond Paleo.” Their products range from breads to condiments, and breakfast treats to crackers, buns, pizza crusts, and desserts. Ms. Schlaman and her all-female team now work with large specialty retailers who represent their brands along with some of the world’s largest food companies to make Nourish Bakery’s products accessible to a national audience. 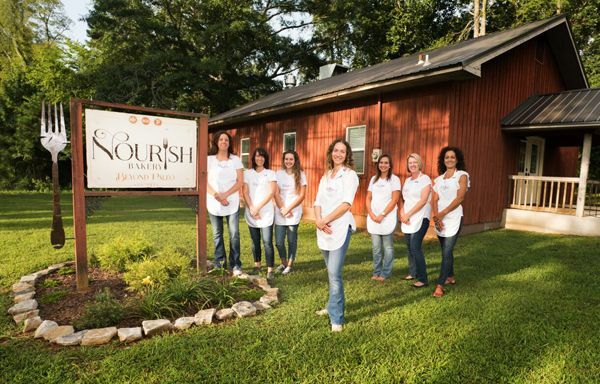 Nourish Bakery is housed in a 100% grain and gluten free facility, and their products eliminate most starches, using only pure honey, fruit or vanilla for sweetener. Low lactose cheeses help provide flavor for some of the products and no artificial colors or preservatives are used. I was really interested in finding out more about Nourish Bakery since my daughter has been on a Gluten-free diet for several years now, and she is one of the healthiest people I know. We ordered a box of products from the bakery, and after sampling their almond bread, cinnamon rolls, pasta sauce, and other products, it is clear Nourish Bakery is on the right track. Their products are not only delicious but make you feel very righteous, even after eating a rich, yummy baked treat. For more information about Nourish Bakery or to view all product offerings, please visit www.NourishBakery.com.